Extra! Extra! Read all about it! #NitPickRick here bringing you some breaking news instead of unpopular opinions for a change. 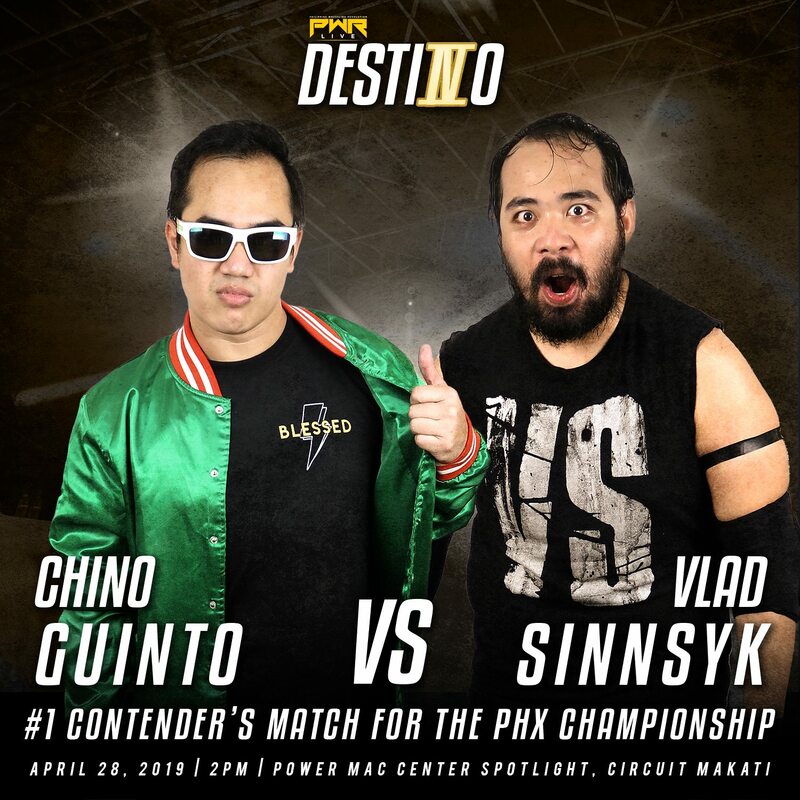 There’s probably one person who won’t enjoy this one and that’s John Sebastian, because at PWR Live: Destino, Chino Guinto and Vlad Sinnsyk will square off to determine who will face the PHX Champion at Wrevolution X. Now let me flex on my journalistic styles for a bit. It’s not a secret that these two have been gunning for the Big White Gold since the year started. Vlad Sinnsyk declared last January that he’s out to hand judgment to John Sebastian’s evil ways and since then, Sinnsyk has been on a major roll. No one was able to stop the Hand of Judgment as he picked up wins against Super Vintendo, Jake de Leon, and even DDT’s Masa Takanashi and DJ Nira. Meanwhile, Chino Guinto has taken the opposite route. The Blessed One made it a priority to regain the title he never lost since returning at PWR Live: New Year’s Wrestle-ution. He came an inch closer at PWR Live: NICE when his recently injured knee prevented him from picking up the crucial win in a fantastic triple threat match. And despite being a favorite, Guinto once again ate dust after being eliminated by Path of Gold runner-up Mike Madrigal. Then there’s The Network reuniting and starting a turf war with the equally menacing Endgame, a team that dominated this year’s Path of Gold match. It’s possible that Jan Evander and his band of misfits will do whatever they can to make Chino Guinto, AB3, and Idol’s lives a living hell. I’ll bet you my bottom dollar the Endgame will cost Guinto the match. But please don’t take that bet. I’m broke af. And let’s not discount the cunning of the paper cham… I mean, the current champion John Sebastian. Considering he’s the other half that keeps the entire PWR afloat, I’m sure his presence will influence the outcome of this match. Who knows, he’ll probably make things worse for himself by doing something that will make his Wrevolution X title defense a triple threat. Fingers crossed? It’s a bit of a stretch, but there’s no shame in dreaming. As a hotshot wrestling journalist, I’m not supposed to give my opinion. But I’m pretty sure Vlad Sinnsyk will take this one home and ultimately win at Wrevolution X. Chino Guinto has way too many chips on his shoulders and besides, it's time for Sinnsyk to take his place as one of the greats. Then he can give his former Deadly Sinns partner Mike Madrigal a shot at his new toy, giving the Revo-nation a rematch of epic proportions. Again, there’s no shame in dreaming. #TeamBlessed or #TeamNyaah. Which side are you on? That’s why you can’t miss PWR Live: Destino on April 28, 2019 at the Power Mac Center Spotlight, Makati. And don’t forget, you heard it here first. Tell ‘em #NitPickRick sent ya.